WHILE the European Union was busy beginning the daunting process of drawing up its constitution in 2002, scientists down the road in Spain were about to discover an incredible super colony of ants. These were two unrelated and disparate events on the surface. However, there are links to be drawn which could go a long way to improving EU relations. 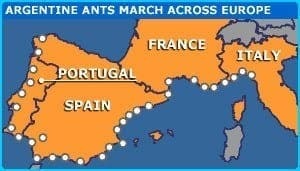 The Swiss scientists discovered a ‘super-colony’ of ants that stretches for 6,000 kilometres, mostly along the Iberian coastline. It is populated by hundreds of billions of ants and has been labeled ‘the largest cooperative biological unit’ ever discovered. It is believed that this species of ants (Linepithema humile) was introduced to Europe about 80 years ago on imported plants from Argentina. Over the past few decades, the Argentine ant has dominated over the 20 or so indigenous species already on Iberian soil. Argentine ants in their home country are particularly belligerent and will fight rival ants from different colonies to the death. However, Swiss researchers discovered that ants from opposite ends of the colony (often thousands of kilometers apart) did not show aggressive tendencies toward one another. Rather, they recognised themselves as members of the same colony, despite their great distance, dissimilar physical characteristics and different environments. Equally remarkable, this altruistic behavior resulted in an extremely high level of social organisation. Visiting ants and established members within the colony collectively searched for food, mated, nurtured their young and assumed complicated hierarchical work tasks. Entomologists offer a few theories for this phenomenon. One explanation is that the entire super colony arose from a very small number of ‘founders’, resulting in the ants acknowledging something inherently common within their DNA. This is known as the ‘kinship selection theory’, whereby altruistic behavior occurs between ‘related’ individuals. A more likely theory is that the Iberian Peninsula is a ‘bonanza habitat’ – the plentiful food and lack of natural enemies precluding the ants’ need to defend territory by fighting unrelated ants. Instead, genes that recognised others as ‘nest mates’ tended not be bellicose but rather devote their energies to the creation of efficient, highly-developed social systems. While Swiss researchers studied the Iberian ant super colony, authors of the European Union’s constitution were imagining a more developed cooperative of vastly diverse peoples. 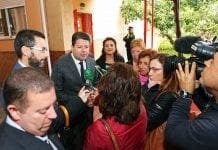 The free movements of citizens, the pooling of natural resources and the creation of efficient political, cultural and economic systems are all stated goals within the European Constitution. Providing for an element of security and territorial cohesion and a type of ‘European interdependency’ are common values sought by the EU. Are these not precisely the very same attributes proven successful by the Iberian ant super colony? Might Eurosceptics and EU supporters alike learn a thing or two from these remarkable insects?